One of the great debates in understanding the nature of earth’s geology is whether the huge volumes of sedimentary rocks covering some 70 percent of the planet’s surface formed fast or slow. This debate has often been portrayed as catastrophist vs uniformitarian, where the uniformitarian theorizers (based on Charles Lyell) are committed to a very slow formation of the overall rock record to substantiate the millions of years they believe the rocks represent. The original geologists were Catastrophists whose founding work was provably associated with acceptance of Noah’s flood. More recently a small group of Neo-catastrophist has risen lead by geologists such as Prof Derek Ager (Swansea University UK) who argue that the original geologists, the catastrophists got it right and were better observers than the uniformitarian theorists (See Ager’s book New Catastrophism by Cambridge University press for more). These Catastrophists carefully detailed the nature of the stratigraphy and very often observed indicators of rapid formation rather than the slow, “gentle rain” idea of sedimentation that Lyell and others propagated. What are some observable indicators that readily demonstrate rapid sedimentation has occurred? Let’s consider just a few. 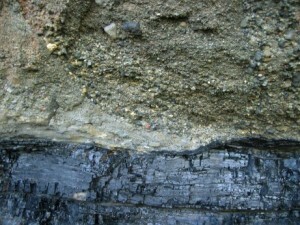 The first and most basic observation is to look at the nature of the bedding itself. Some rapid sedimentary processes can be demonstrated in a lab or observed in present day local flooding events. These include bedding characteristics that are curved or trough-like and have high angles known as cross-bedding. These are very good indicators that the sedimentation process was fast. These overt characteristics of bedding are readily observable in all types of sedimentary rocks. Typically, they are thought to be associated with sandstones, but in fact they are observed in limestones and sometime even in shales both of which are usually claimed to represent very slow sedimentation. They have even been seen in thin coal seams and in sediments just above and below such seams. 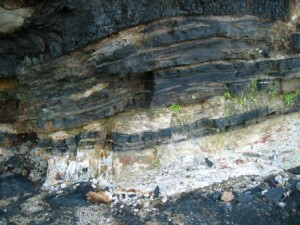 In addition, sometimes beds abruptly change their composition or inter-finger with beds above and below that indicate that a rapid change in source material took place, as in the photo below. So our first principle when considering as to whether an outcrop formed rapidly or slowly, one needs to look at the bedding characteristics and the detailed nature of the sediments. The second detailed aspect of observation to be considered is the content or lack thereof of fossils in the strata. 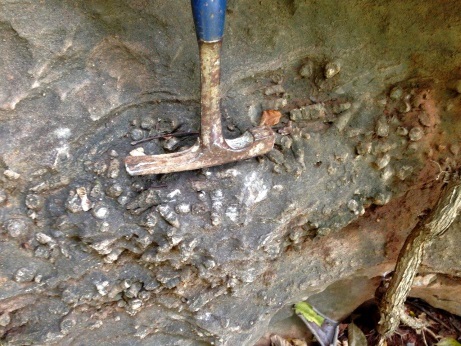 Since uniformitarian geologists believe the sedimentary rock record is composed of buried paleo-environments, then you should expect to see a representative ecology “frozen” in the rocks. You would expect to see an array of heterogeneous plants and animals that lived together, died together and slowly were covered to be fossilized remains. Thus you interpret the rock layers as successive events in a prolonged history of life. However, a detailed look at any particular rock outcrop does not present evidence that the majority of strata are buried environments. In many cases you see just one or two prominent fossil types only that clearly do not demonstrate an ecological system has been preserved. 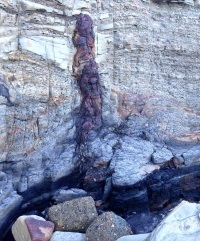 In some sediments you see tens of feet (many metres) of layers with no fossils whatsoever. In most cases when fossils such as corals or bivalves are observed they certainly do not represent life that was captured in “growth position”. The writer has observed layers of tube corals such as lithostrotian, all broken yet with horizontal parallel positioning by the millions, which have obviously been current deposited indicating rapid catastrophic burial, rather than a slow cover-up as sediments encroached to encase them where they might have lived. 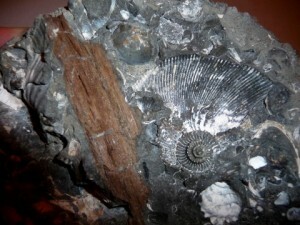 One way of unravelling the argument as to whether strata with fossils are buried ecological zones, is to determine whether the fossils found actually represent lifeforms that typically lived together. The fact is you often find “mixed environments” represented. You see land plants with marine organisms, insect and flowers with fishes, etc. and this is very common in the rock record throughout. This photo shows a sea shell buried with piece of wood from a southern conifer tree. All of which demonstrates that these are not concise ecological niches that have been preserved in the rock layers. Rather they have been mixed up catastrophically most prominently by flooding. One common phenomena observed all over the world is the presence of what is known as “polystrate” fossils that penetrate many layers of sediments, with the same level of preservation up the entire trunk. Any slow burial in a swamp or whatever would show in the different quality of preservation at different heights along the trunk, as many trees usually don’t last much more than a year when encroached by invading water and sediments that alter their necessary growing requirements. Equal preservation quality clearly indicates that sedimentation had to be rapid or they would not be preserved. 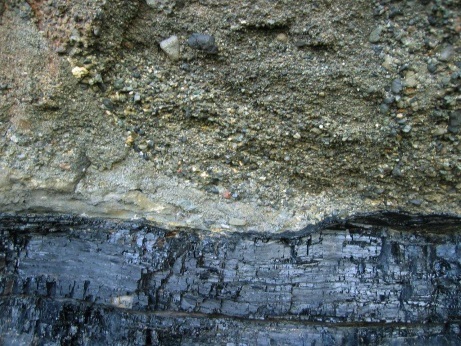 In fact there known vertical fossilized trees that penetrate tens of feet (many metres) of sediments with perfect bark impressions preserved bottom to top. Finally, there are tens of feet of sedimentary layers particularly vast quantities of limestones with virtually no fossils present whatsoever. Is one to believe that all of these supposed source organisms were recrystallized into the rock material without preserving any of the lifeforms that supposedly composed the “buried environment” that these rocks represent? When answering the question as to whether a particular outcrop was formed rapidly or slowly one must consider these and other factors when answering that question. It is unfortunate that most modern geologic interpretations are very often limited by the indoctrinated assumptions of the observer rather than the very nature of the rock outcrop itself. It has to also be conceded that the rejection of rapid catastrophic processes has more to do with rejection of the Biblical account of Noah and the Flood, rather than with any facts found in the rocks. Never forget it was Lyell’s work that Darwin used to base his millions of years of evolution on, which has now become a dominant reason many refuse to even consider rapid formation of strata as it removes the very reason for Darwin’s theory. 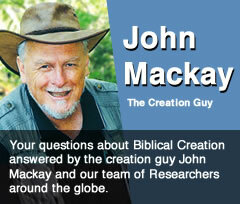 If earth’s many coal seams formed slowly in swamps, isn’t the world is too old for the Biblical record to be literal? Answer here. Bob Powell is a geologist who has worked for the Tennessee State Division of Geology including five years as a Field Geologist. He published the Pilot Mountain Geologic Quadrangle (7.5 minute) and has undertaken private Geologic Consulting concentrating on Hydrogeologic studies at contaminated toxic waste sites with emphasis on the Fate and Transport of Contaminants in Groundwater. With the decline in mining in Tennessee Bob was moved to the Department of Environment and Conservation spending some 30 years as Project Manager/Geologist/Enforcement Manager in the Division of Remediation .